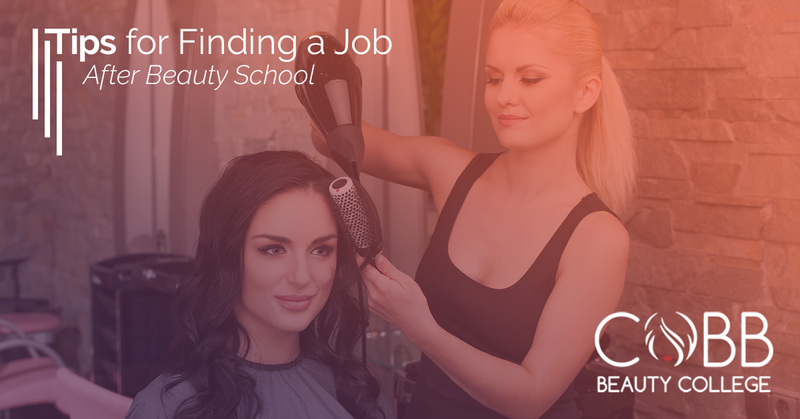 Once you’ve graduated from beauty school and passed your licensing exam, it’s time to find a job! When you’re in school, all you really have to worry about is getting your homework done, passing tests and, finally, passing the licensure examination. But once school is over, the real world begins, and that means that it’s time to find a job. Many students are worried that they won’t be able to find a job after beauty school, and here at Cobb Beauty College, we want to help you to be as prepared as possible for your life as a cosmetologist. That’s why we’ve come up with this list of tips to help you find a job after beauty school. #1. Figure out what you want. In our previous blog, we went over some of the most common myths about cosmetology school, one of which is that you’ll have limited career opportunities once you graduate. However, there are actually a plethora of different paths you could take. Even if you decide to work in a salon, like most beauty school graduates do, there are many different types of salons you could work in. That’s why the first step towards finding a job after cosmetology school is to figure out what you are looking for in a job. #2. Take advantage of placement services at your school. There are many different beauty colleges you could attend, but the best of the best do more than just help you get through your examinations — they’ll help you land a job! Here at Cobb Beauty College, we work with local salons to help our graduates find the right career for them once they graduate. Utilizing these placement services will give you a headstart towards finding a career you can feel good about. Not only will having guidance throughout the process help you in landing a job, but it will also teach you valuable skills that you can use throughout your life. #3. Look for a salon locally. When you graduate from beauty college, it’s a good idea to start your job search in the same community as your college. Many of the local managers and salon owners are probably already familiar with your school, and they may even have their own special relationship with them already. As long as you’ve picked a beauty school that has a reputation for producing talented cosmetologists that are willing to work hard, the familiarity can help new graduates land a job more easily. Local salons that are more familiar with your school will be more willing to give you a shot, whereas other salons might be more cautious about hiring someone right out of college. While there’s no guarantee that you’ll get a job the day you graduate, we’re confident that these tips will help you find the right, post-beauty school job for you! If you would like to learn more tips for getting a job after beauty college, please stay tuned for our next blog. And if you would like to learn more about Cobb Beauty College and the programs we have to offer, contact us!